Mateus Schreiner Garcez Lopes, PhD, MBA serves as Global Manager of Innovation in Renewable Technologies at Braskem, the largest petrochemical company in Americas and considered as one of the world ́s 50 Innovative companies by Fast Company (2014). 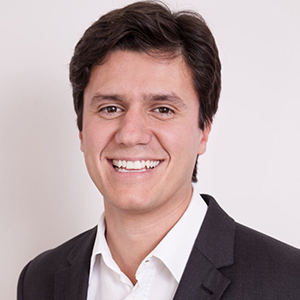 He is responsible for technology valuation, partnerships, open innovation and R&D projects related with renewable technologies, including the Renewable Chemicals Research Center in Campinas and operation in Boston. He had worked at the Friedrich-Alexander-Universität in Germany, the Natural Energy Institute (USA) and the Institute of Biotechnology from UNAM (Mexico). Former member of Industrial Advisory Board for NSF Synthetic Biology Engineering Research Center (SynBERC), Board Member of the Brazilian Association of Industrial Biotechnology (ABBI), founder of the first synthetic biology online community in Brazil (synbiobrasil), mentor at the first synthetic biology accelerator in the USA Indie.Bio and advisor at Lotam (Brazilian agrochemical iRNA startup).